Not to be confused with New Enforcers. Cover art for Daredevil (vol. 2) #102. The Enforcers are a fictional team of villains appearing in American comic books published by Marvel Comics. Created by writer-editor Stan Lee and artist and co-plotter Steve Ditko, the team's first appearance was in The Amazing Spider-Man #10 (March 1964). The Enforcers appear often in the early issues of The Amazing Spider-Man, debuting in #10, and returning in #14 and #18–19, in the latter two issues teaming with the supervillain Sandman. The team would go on to appear in Daredevil #356–357, and Dazzler #7–8, and fight Spider-Man again in Marvel Team-Up #39–40 and #138, The Spectacular Spider-Man #19–20, Spider-Man (1990s series) #94–95, Spider-Man, vol. 2, #28, and elsewhere. The Enforcers are a group of hired assassins and extortionists, each with an expertise in a different unique area of combat, whose goal it is to aid various employers in the takeover of New York City's criminal gangs. In their first appearance, the Enforcers aided the Big Man (Frederick Foswell) in his attempt to gain control of New York City's criminal gangs. They clashed with the superhero Spider-Man for the first time, and are defeated by him. They were subsequently employed by corrupt industrialist Norman Osborn, hired them to shut down Malone's Flophouse in a bid to gain the land. However, then-amnesiac Malone resident Namor the Sub-Mariner thwarted them, later destroying Osborn's construction equipment. They next aided the Green Goblin in his first unsuccessful attempt to eliminate Spider-Man, but were again defeated and jailed. Soon after that, they joined forces with the Sandman to subdue the Human Torch at a point where it was believed Spider-Man had become a coward, but are defeated by the combined might of Spider-Man and the Human Torch. The Enforcers clash repeatedly with Spider-Man and occasionally other heroes such as Daredevil. Foswell is eventually unmasked, but later reforms and is killed. After the Ox, later, also appears to have been killed, Montana and Fancy Dan team with a new Big Man, as well as with the Sandman and a new Crime Master, Nick Lewis, Jr. son of the original. During a battle in which the team is defeated by Spider-Man, the Human Torch, and the Sons of the Tiger, Crime Master shoots the new Big Man, learning belatedly that this "Big Man" was, in fact, a woman — Janice Foswell, daughter of the original and the younger Lewis' romantic interest. The Enforcers were hired by the Lightmaster, who introduced a new Ox, Raymond Bloch's twin brother Ronald Bloch, to the team. The Enforcers are once again defeated by Spider-Man. They later battle the mutant superheroine Dazzler. The Enforcers return with new members Snake Marston, a master contortionist and Hammer Harrison, a boxer who wears steel hammers over his hands. The Enforcers come under the employ of the Kingpin, but were defeated by Spider-Man and the then-reformed Sandman. This lineup appears only once more, to fight Daredevil. The original Ox (Raymond Bloch) returns, revived by the criminal mastermind the Kingpin. It is unclear whether it is Raymond or Ronald Bloch who appears with Montana and Fancy Dan in subsequent battles with Spider-Man and She-Hulk. During the events known as the superhero Civil War, either Raymond or Ronald Bloch and Snake Marston are recruited into the Thunderbolts, a team of reformed villains. Following the events of the storyline "Spider-Man: Brand New Day", the Enforcers are patrons at the Bar with No Name. They take bets with a person calling himself "The Bookie", over whether Spider-Man will show up to battle "Basher", an unknown villain who claimed to have fought Spider-Man. Spider-Man shows up, but is revealed to be Screwball in disguise when the real one shows up at the scene of the fight. The Enforcers decide to get revenge on The Bookie, capturing him. The Bookie's father calls Spider-Man for assistance, and he agrees to help. Spider-Man defeats Fancy Dan and Montana, and saves Ox from being flattened by a falling roller coaster. Grateful for the save, Ox agrees to come along quietly. During the "Origin of the Species"' storyline, Spider-Man goes against the villains after Menace's infant was stolen from him by the Chameleon. The Enforcers were not actually part of this group where they quoted "we're The Enforcers, not The Kidnappers." They got caught in the crossfire anyway when Sandman tries to recruit them to join up with him. Montana then started working for the Kingpin. During a fight which resulted in the Kingpin's office crumbling, the Hobgoblin lets him fall to his death to take his place as Fisk's right-hand man. The Enforcers (Fancy Dan, Ox, Snake Marston, and Hammer Harrison) are reassembled by the fourth Crime Master, who convinces them and Black Cat to assist him with breaking Hammerhead and Tombstone out of Ryker's Island. The attempted breakout is prevented by Spider-Man and the Wraith, and the Crime Master is revealed to be an imposter who Mister Negative had instructed to assassinate Hammerhead and Tombstone. Fancy Dan - A diminutive martial artist. Daniel Brito was born in Brooklyn, New York. He has great proficiency with judo, karate, and fancy footwork. Ox - Raymond Bloch is a brutish strongman and the twin brother of Ronald Bloch. Montana - Jackson W. Brice is an expert lasso-wielder. Ox - Ronald Bloch is a brutish strongman and the twin brother of Raymond Bloch. He became the second Ox after the apparent death of Raymond. Snake Marston - Sylvester "Snake" Marston is an expert contortionist. Hammer Harrison - Willard "Hammer" Harrison is an expert boxer who wore two diamond-hard steel hammers on his hands. In the Earth X reality, the Enforces consisted of Fancy Dan, Ox, and Montana with Vulture as a later addition. They would be hired by President Norman Osborn to act as his bodyguards. However, the Enforcers would fail in this task when the Skull arrived in New York to take over the United States. Like all who encounter the Skull, the Enforcers would be put under his control and Norman Osborn would be murdered. The Enforcers fate following the Skull's death remain unrevealed. In Spider-Man Noir, the Enforcers are the muscle working for mob boss Norman Osborn, also known as the Goblin. Like the rest of the Goblin's goons (Kraven and Adrian Toomes), they are former carnies. Fancy Dan makes a cameo appearance in an issue of The Amazing Spider-Girl as the owner of a company called Brito Imports and the leader of the Brooklyn gangs. The Enforcers appear when Mayday/Spider-Girl ended up within the mind of her father, observing his first encounter with the original Green Goblin. Frederick Foswell was called Mr. Big and was not associated with the Daily Bugle - but videotapes of his untimely murder by the Kingpin were sent to Ben Urich and used for a Daily Bugle exclusive. "Fancy Dan" was re-imagined as a young gunslinger and was called Dan Crenshaw. "The Ox" was re-imagined as a Black Dominican called Bruno Sanchez. "Montana" had the civil name Montana Bale and used a whip instead of a lasso (although he often used it to strangle Spider-Man like a lasso). After losing three times to Spider-Man, along with unofficial member Electro, the Enforcers supposedly disbanded. Much later, they came back together to work for Hammerhead. This pitted them directly against their former employer. In the 1967 Spider-Man cartoon's episode "Blueprint For Crime", Ox and Montana (known as Cowboy) were employed by the villain the Plotter to steal missile blueprints. The Enforcers appear in The Spectacular Spider-Man, with Fancy Dan voiced by Phil LaMarr, Ox voiced by Clancy Brown and later by Danny Trejo, and Montana voiced by Jeff Bennett. They appear in the first episode, "Survival of the Fittest", along with Hammerhead. In the episode they are employed by the Big Man who is unseen. In the show, the Enforcers use modern weaponry, suits, and equipment. Montana is the leader and strategist of the team, with a strong southern accent. Instead of a lasso, he uses an attack helicopter with various weapons and gives the orders to the rest of the team (though in "Opening Night", he uses several tied-together bedsheets as a lasso). Ox is a simple-minded strongman. Fancy Dan is a martial artist skilled enough to combat Spider-Man despite his superhuman powers. This incarnation is African American. At the end of the episode, Fancy Dan and Ox are captured but Montana escapes. He reappears several episodes later as the series' version of the Shocker. In the episode "Group Therapy", the Enforcers escape Ryker's Island with the Sinister Six, having been freed by Sandman; however Montana stays behind as the Shocker while Ox and Fancy Dan escape with Hammerhead. The Enforcers reappear in the episode “Probable Cause” dubbing themselves the New Enforcers. Fancy Dan is given a suit that allows him the ability to increase his kinetic energy and takes the name Ricochet, while Ox’s suit increases his impressive strength. They fight Spider-Man in the Metro Bank, then escape to the nearby laundry to disguise as policemen to break into the Vault. They fight Spider-Man in the Vault which contains billions worth of gold. They try to escape in a prepared train, fighting Spider-Man at the same time. Spider-Man reverses the train and tumbles the train, destroying Ox's suit and losing all their gold. They are about to get away, but Hammerhead spikes their car, thus getting arrested. In the episode "Opening Night," the Enforcers were seen as prisoners in the Vault until the Green Goblin releases all the prisoners as Silvermane enlists the Enforcers to rally the prisoners into defeating Spider-Man. The Enforcers appear in the Ultimate Spider-Man episode "Nightmare on Christmas", with Fancy Dan voiced by Steven Weber, Ox voiced by Mark Hamill, and Montana voiced by Troy Baker. In a dream sequence that is done by Nightmare, Spider-Man ends up in the past where he is in a fight with the Enforcers where they get away with a truck filled with Oscorp technology. Spider-Man mentioned that he hasn't fought the Enforcers since before joining up with S.H.I.E.L.D. Thanks to his good conscience and bad conscience (where Nightmare was posing as his bad conscience), Spider-Man's web fluids are restocked where he manages to catch up to the Enforcers where Spider-Man ends up fighting Ox and Montana on top of the truck while Fancy Dan drives the truck. Spider-Man webs up Ox and Montana and leaves them webbed up on a lamp post. Then Spider-Man webs up Fancy Dan as Spider-Man's good conscience and bad conscience work to stop the truck. In earlier plans for the Spider-Man 3 video game, the Enforcers were planned to be in the game as the leaders of the three gangs in the gang wars missions on the PS3 and Xbox 360 versions but were cut before the first beta was made. 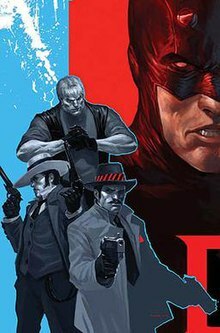 The Noir version of the Enforcers appear in Spider-Man: Shattered Dimensions. They were mentioned and seem to work for Hammerhead. One of Hammerhead's minions state that Fancy Dan "The Ladies Man" was found dead in a trash can apparently for flirting with Hammerhead's girlfriend Janice Foswell. Ox was mentioned to be the stupidest of the Enforcers. Snake Marston is mentioned as well. The Enforcers appear in the video game Marvel Heroes. They kidnapped the superhero Speedball and almost kill him. However, they are caught in the act by Jean DeWolff who kills them all which Kingpin later takes advantage of. ^ Amazing Spider-Man #10. Marvel Comics. ^ Tales of the Marvels: Inner Demons. Marvel Comics. ^ Amazing Spider-Man #14. Marvel Comics. ^ Amazing Spider-Man #18-19. Marvel Comics. ^ Daredevil #86. Marvel Comics. ^ Marvel Team-Up #39-40. Marvel Comics. ^ The Spectacular Spider-Man #19-20. Marvel Comics. ^ Dazzler #7-8. Marvel Comics. ^ Marvel Team-Up #138. Marvel Comics. ^ Daredevil #356-357. Marvel Comics. ^ Spider-Man (1990s series) #94-95. Marvel Comics. ^ Spider-Man vol. 2 #28. Marvel Comics. ^ She-Hulk vol. 4 #1. Marvel Comics. ^ Thunderbolts #103-104. Marvel Comics. ^ Amazing Spider-Man #563. Marvel Comics. ^ Amazing Spider-Man #645. Marvel Comics. ^ Amazing Spider-Man #648-651. Marvel Comics. ^ "Comics Continuum by Rob Allstetter: Monday, August 27, 2007". Comicscontinuum.com. 2007-08-27. Retrieved 2011-02-07. ^ "Comics Continuum by Rob Allstetter: Monday, January 14, 2008". Comicscontinuum.com. 2008-01-14. Retrieved 2011-02-07. This page was last edited on 23 March 2019, at 17:18 (UTC).